I made these bad boys for the Fourth of July since they looked festive and were extremely refreshing for an outdoor gathering. 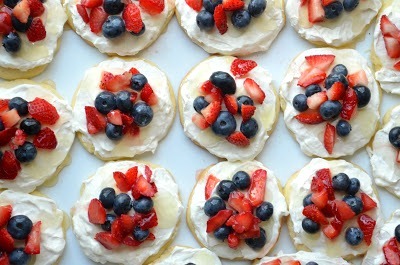 I made my favorite sugar cookie recipe, and then topped them with a cream cheese/whipped cream frosting, strawberries and blueberries, and a pineapple glaze. Pure perfection! The glaze was my favorite part, so don't skimp out on that. Just be careful it doesn't run down the side so you don't run the risk of getting the cookies soggy. The cookies are soft and moist, and the cool topping makes them a refreshing summery treat. I'm sure these will go in a heartbeat at any gathering. Enjoy! Prepare sugar cookies as directed. Set aside. For glaze, in a small saucepan, combine the sugar, cornstarch, pineapple juice, water and lemon juice until smooth. Bring to a boil; cook and stir for 2 minutes or until thickened. Transfer to a small bowl; refrigerate until cooled but not set. In a small bowl, beat cream cheese and confectioners' sugar until smooth; fold in whipped topping. Spread over tops of cookies. 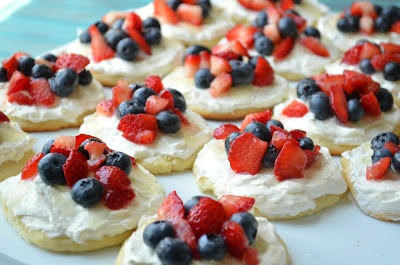 Arrange fruit on top of each cookie; drizzle with glaze. Refrigerate for 1 hour or until chilled. If your kitchen has any non-load bearing walls that can be opened up to provide a visually larger area, do it. If it's possible to combine a dining area with the kitchen, do it as well. This will result in a larger kitchen. One of my favorites! I always eat way too much of this!